To reset your password please enter your email below. If you've been invited to use Hipla by an estate agent then please use the link that they have provided and you'll be able to sign up using that. We're limiting access to only those clients of our early partnering agents. The buyers buying position scores (the 'Mortgage Score' & 'Property Score') which shows their progress towards raising mortgage finances (if applicable) or the selling of any properties (if applicable). Valuations progress and details of any valuations that the buyer has had, so the seller can compare these to the marketed price of the property where an offer has not already been accepted. Marketing progress and details of the marketing specifics. Offers progress and details of any offers that have been received and whether these have been accepted or not. The buyers Hipla max property price (calculated based on the information that has been provided) so the seller can see that the buyer can afford to purchase their property. No individual breakdown of the inputs into calculating this are provided, but a 'Confidence Level' and explanations of that confidence level are, i.e. if there are no valuations or offers on a property then we have to use the buyers own provided valuation and thus they receive a lower confidence level. Additionally, the seller will also be able to see these details for anyone who is below the buyer in their chain (assuming their details are also in hipla.co.uk too). And finally, any agents that the seller has registered with (as a 'buyer') will also be able to see the above (except for the specific details of any valuations that have been done). If applicable, the sellers buying position scores (the 'Mortgage Score' & 'Property Score') which show their progress towards raising mortgage finances (if required) or the selling of any properties (if required). Additionally, the buyer will also be able to see this summary information for anyone who is above them in their chain (assuming their details are also in hipla.co.uk too). No further detailed information is provided to the buyer. We'd like you to register your FREE Home Buyer Passport with our branch, to help you position yourself ahead of other potential buyers. But if you really don't want to you can unsubscribe and we won't contact you through Hipla again. Please unsubscribe me from future notifications to register my details with this branch. We'd like to stay in touch, but only in ways that you find useful. If you are a 'buyer' and your Hipla scores aren't as good as they could be, then we'll send you a reminder that you have outstanding actions in your dashboard to work through. Doing so will improve your Hipla scores and make you more appealling as a buyer, which means you're more likely to find out about new properties coming to market and more likely to have your offers accepted. Every now and then we may send you a tip on how to improve your Hipla mortgage score. Following the tips will make you more appealling as a buyer, which means you're more likely to find out about new properties coming to market and more likely to have your offers accepted. Every now and then we may send you an email promoting one of our partners. 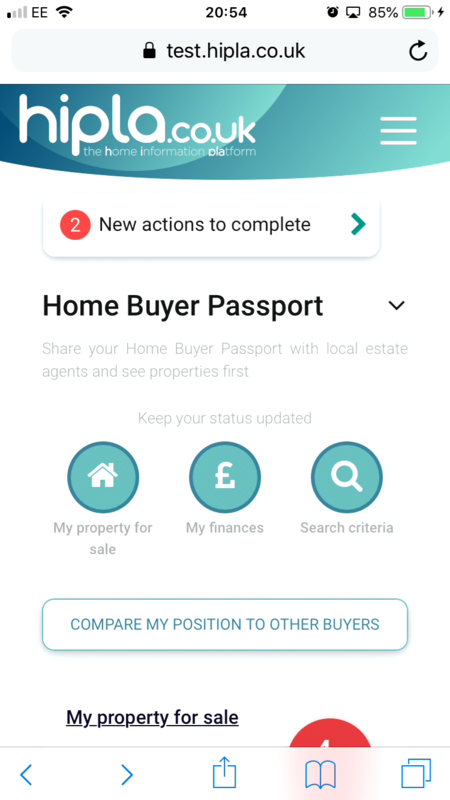 Select which estate agent branches you'd like to share your details with and they'll also receive future changes to your 'buying position' automatically. The below estate agent branches would like you to share your details with them. In doing so they'll also receive future changes to your 'buying position' automatically. If you want to register with a different estate agent click here. Better engage your local estate agents by showing them that you're a serious buyer to find out about properties first. See how your buying position compares to other local buyers looking in your search area and at the same properties as you. Let us help you calculate your maximum search price based on your current equity, mortgage loans, savings, stamp duty and moving costs. We'll guide you step by step on how to improve your buying position, so you're more likely to have your offers accepted and can transact quicker with less risk. Use your strong buying position to get your offer accepted. 1. Create passportSecurely provide your data to create your Home Buyer Passport. 2. ShareOnly provide your data once and share it with multiple estate agents, saving you time and effort. 3. Buy your dream homeWell positioned buyers are more likely to have their offers accepted or be able to better negotiate on price.